Indian Air Force Notification is out. Indian Air Force is recruiting for 100+(Not Specified) Group Y (Non-Technical) Mayurbhanj Govt Job Posts. You can check Indian Air Force - Indian Air Force last date, download Indian Air Force notification, visit Indian Air Force official website and check other Indian Air Force Vacancy details.Complete Vacancy and recruitment Details about 100+(Not Specified) Group Y (Non-Technical) Mayurbhanj Govt Job vacancies in Indian Air Force are provided below by JobSarkari.Com only for you. Last Date for IAF Rally. 03/03/2019. Chhau Padia, Baripada, Mayurbhanj, Odisha up to 10 AM on 27 February 2019 and 01 March 2019. Q. 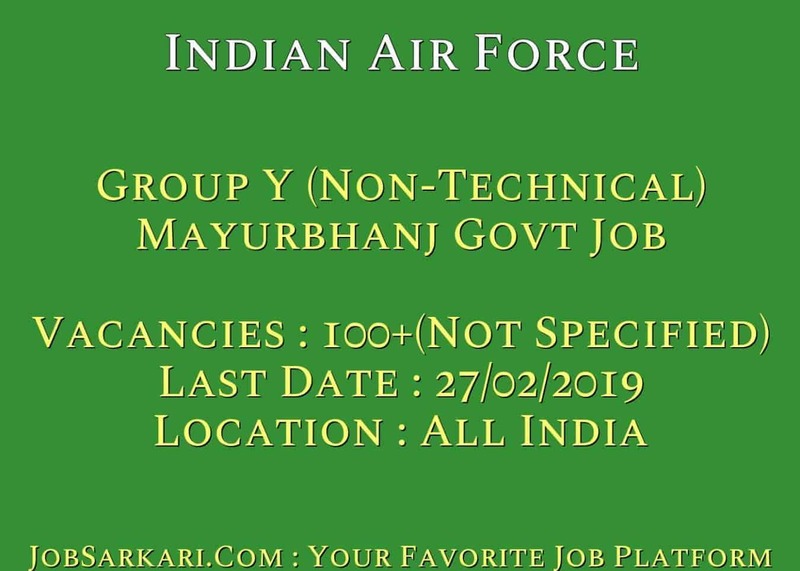 What is the Last Date For Indian Air Force Group Y (Non-Technical) Mayurbhanj Govt Job Vacancy ? A. 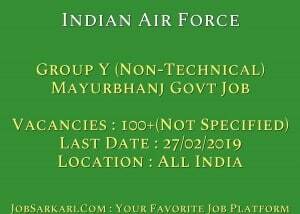 Last Date for Indian Air Force Group Y (Non-Technical) Mayurbhanj Govt Job Posts is 03/03/2019. Q. What is the Form Type of Indian Air Force Group Y (Non-Technical) Mayurbhanj Govt Job Recruitment ? A. The Form Type for Indian Air Force Group Y (Non-Technical) Mayurbhanj Govt Job Posts is Offline. Q. How many vacancies are available in Indian Air Force Group Y (Non-Technical) Mayurbhanj Govt Job Posts ? A. There are about 100+(Not Specified) Vacancies in Indian Air Force Group Y (Non-Technical) Mayurbhanj Govt Job Posts. Aap is Link Se Sabhi 12th pass Sarkari Naukri ke Liye Apply kr Sakte Hain.. Please Go through With Notification..